I reread a number of books in 2013 - which is a recommendation in itself - but this post is about the first time reads that I enjoyed the most and would recommend to others. The recommendations are not entirely universal - after all, people have different tastes in reading - but most, if not all, of them should be appealing to a literary omnivore. I invite you to visit the Pinterest board I made with cover images and mini reviews of these books. Just click on the screen-shot below and off you go. The link will open in a new window. Very artistic! I can't seem to get WordPress to do a gallery like your's correctly. It keeps chopping off part of the book covers. I think 2014 will be a good year for publishers and readers. 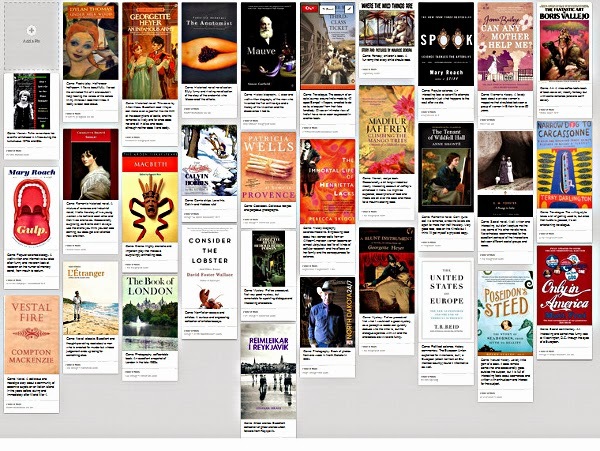 George, I made this by pinning images of the book covers onto an online memo-board called Pinterest and then taking a screenshot of it. I have given up trying to post images side-by side on both Blogger and Wordpress - they never come out the way I want them to. Very clever! I'll give your method a try. I've been using WordPress for years, but somehow they just can't get the gallery feature to work right.